The GA-ship is designed to build professional capacity in programming, research support, and undergraduate mentorship. Eleven faculty will be in residence to pursue their research within the interdisciplinary community of Kaplan for the 2019-20 academic year. Rising Seniors: Apply for the Franke Undergraduate Fellowship! Teach in the Odyssey Project for 2019-20! The Odyssey Project is a free, 32-week college credit granting humanities program for income-eligible adults with limited to no access to higher education. The program is sponsored by Illinois Humanities, and Northwestern faculty and graduate students are invited to apply to teach in Critical Reading and Writing, Literature, U.S. History, Art History, or Philosophy. Kaplan's Artist in Residence program seeks to facilitate creation of new work and to provide insight into the process of conceptualizing and producing creative work. We invite Northwestern units to apply to co-sponsor artists for 2019-20 and beyond! 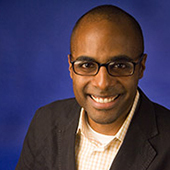 Professor Gadsden will discuss the African Americans who served on the 1960 campaign and helped JFK win the Black vote and the American Presidency as part of the Kaplan Institute's evening Humanities Lecture Series at Evanston Public Library. How have artists, writers, historians, and musicians participated in, memorialized, and critiqued revolutionary movements? Read essays from students—on revolutions in Mexico, Russia, America, Cuba, Haiti, and France—in John Alba Cutler's Fall 2018 Global Humanities Lab, which began with field research in Mexico City!